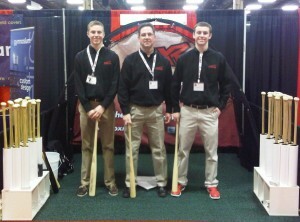 ST. LOUIS (Feb. 4, 2011) – The ProXR bat made its official debut into the baseball market at the American Baseball Coaches Association (ABCA) convention in Nashville. ProXR came away from the January event with the prestigious Best of Show Award for its innovative new angled bat knob technology. ProXR was chosen from a number of new cutting-edge baseball products showcased at the ABCA, the largest baseball convention in the world . “This ProXR design may very well permanently change the baseball bat as we know it!” said John Pinkman in Collegiate Baseball Magazine. New designs and innovations that challenge the status quo of traditional baseball equipment, especially with something as sacred as the baseball bat, face extraordinary scrutiny and skepticism from players, coaches and baseball purists. But as a new design that received its U.S. patent in 2010, the ProXR bat knob has experienced unprecedented acceptance at the highest level of baseball. This past season ProXR was successfully used in major league games by New York Mets Mike Hessman and Milwaukee Brewers All-Star power hitter Prince Fielder. Click here to read the complete article from Collegiate Baseball.